For the book lovers! Buy Ulam Meal and regular shake (or soft drink) and get a FREE E-Book of “Rise Of The Darkness” by Australian Award Winning Author & Film Director C.A.Milson! It is not often I do a promo of my books, but this poster was done for us by a friend here in Naga City. Okay I have been off the radar for a whiles, but that is okay. A lot has been happening in my life as of late. This year has been a ride from one thing to another. Some may know that I was dating someone who was extremely toxic. Both in her behaviour towards me and my son, and also to my friends. She was a real nut-job to say the least. But bad things cannot be remembered or dwelled on. A few months ago, I met a lovely lady through online dating. Needless to say, online dating can be daunting. Considering that I also met my now ex-wife from online dating, and after taking a journey half-way across the world, that marriage ended in divorce. That was our first date, which lead to spending a lovely week together in Macau. Macau will always be a special place for us. It is not only a beautiful city with more casino than Vegas, but it is the city where we got engaged 🙂 Here are some photos of the place where Grace and I got engaged. A very scenic place, with lovely views all over the city. After a memorable week in Macau, it was off to Philippines together to meet Grace’s family, and spend a week in Bicol. What happened next was the longest month of my life. I journeyed home and spent the next 30 days working and counting the days until I came back to the Philippines, to be reunited with my fiancée. 30 days. 30 long days and nights passed. Every day Grace and I spent time together on Facebook video and Skype. As much as we both loved spending that time together, it was not enough. For a month I saved all I could so that my son, David, and I could get back to Philippines. For Grace, that meant staying with a friend in Manila. While for us, it meant that David needed to get a new passport, which was not easy as I needed to get Anna to sign off on his application, since she is David birth mother. Good thing was it took just over a week to get his passport after the forms were lodged. On a journey that started in March, we took the next step in our journey and got married on Saturday August 5. Our journey together as husband and wife began yesterday, and no doubt, this marriage will last, as for the first time in my life I am with a partner who is equally yoked, which is biblical. Yes, sometimes we have differences of opinion, but we never argue or fight. We talk about things, what is right and not. For Grace, being a mother is a new beginning for her, and even though David can be a handful for anyone (especially Grace’s family), they understand his ADHD condition and accept it. David is adjusting well to life here. He is excelling at Tagalog, which I am very proud of his accomplishments that he has achieved. He too, has a long way to go as he learns to adjust in a new school, with new friends and a new lifestyle. Our Journey is only beginning……..
C.A.Milson. Author of the horror series, The Chosen, will be signing copies of his novel, Rise Of The Darkness this coming Saturday, October 17th. 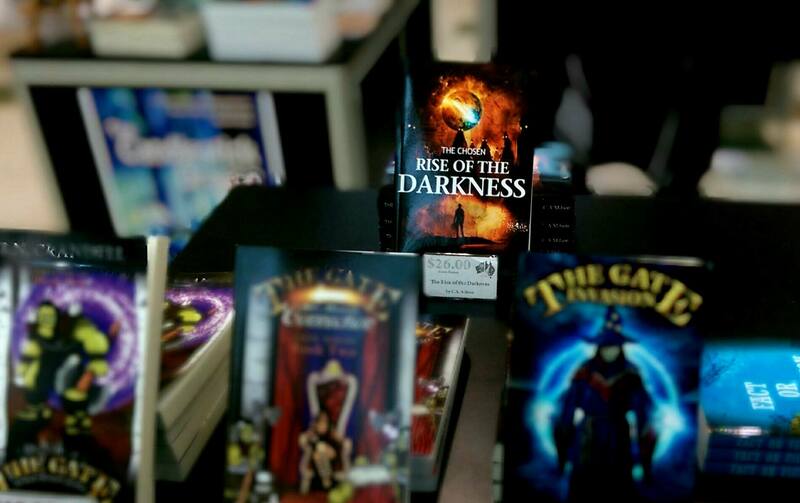 Award winning author and indie filmaker, C.A.Milson will be signing copies of his book, The Rise Of The Darkness, at the OzAuthors Stall at Brimbank Shopping Centre on Saturday October 17th from 11Am til 1PM. If you are in the area, drop in and meet the author. Reblogged from Horroraddicts.net. Many thanks to David for his review. Alex is a man who is down on his luck, he lost his fiance’ and parents and is now being plagued by horrible visions. In these visions he sees a wasteland of dead bodies and a beast that is not human. Alex struggles to find answers and has been going to paranormal conferences to find them. Over time he meets some investigators and learns of a prophecy that will bring about the end of humanity. An old god will arise bringing an army of demons and zombies to kill all the humans and start a new world order. Alex finds out he is the chosen one who can stop the coming darkness and save the world as we know it. Not only will Alex have to fight one old god, there is also another spirit who is trying to gain power and Alex has to fight his inner demons as well. He has help from a team of paranormal investigators, but will it be enough to stop the darkness from taking over? 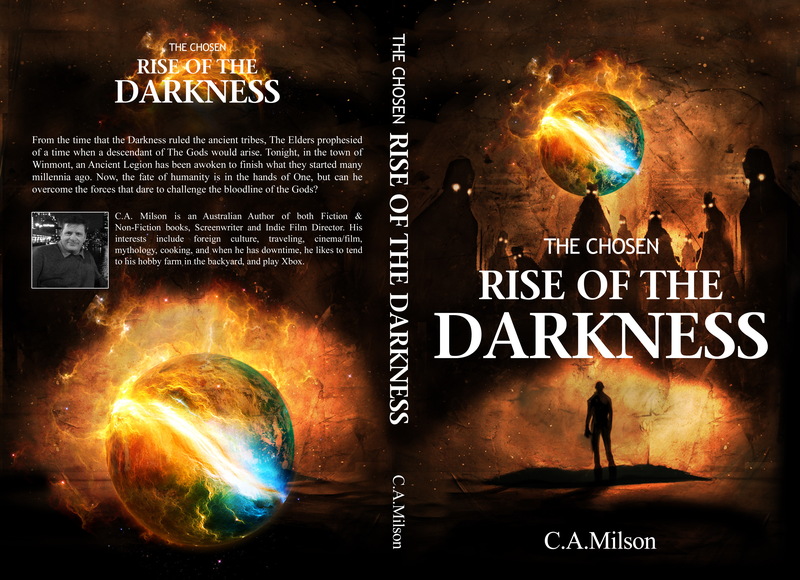 The Chosen: Rise Of The Darkness by C.A. Milson is a story with a lot going on. Alex is the star and my favorite character but he’s only a small part of a big story. I loved the character of Alex because of the transition he goes through. He goes from rock bottom trying to get over the tragedies in his life to being the only one who can save humanity. The interesting part of his character is that he doesn’t want any of this, he doesn’t want the power that is growing within him and he doesn’t want to be responsible for saving the world. He wants his fiance’ back and a simple life. Alex is thrust into a horrible situation and doing what he has to do. I liked him because I think most people can relate to him. There were some great villains in this story, one is Tanzac who was a fallen angel and the other is Jamison who is an evil spirit who hates everyone. Jamison is the perfect villain, he was a cult leader and spent his life and death influencing people to do bad things. Jamison is the kind of guy in a book that I love to hate. Tanzac the other bad guy is sympathetic and actually shows compassion at points in the book. I love it that this book has a villain that seems to be very complex and another that you just want to see destroyed. My favorite part of this book was a scene where a man decides to do a mock satanic ritual to get revenge on a couple of people. While he does some evil deeds he awakens something far worse. I liked how the demon that shows up does good by default. The characters in this story are great and complex. In addition to the characters there is a theme about new beginnings in this book and good coming from evil along with some religious metaphors. My only problem with Rise Of The Darkness was that I felt it lacked suspense at times but the great characters make up for it. Rise Of The Darkness is the beginning of a trilogy and its a good book about good versus evil. Get the Ebook at ASJ Publishing.